When it comes to sport headphones, the competition is increasingly fierce — and the X4 is industry veteran Jaybird's attempt to stay near the top of the heap. In most respects, the X4 is like any other set of Bluetooth headphones. If you really want to you can pair them with your iPhone, pop them in and go. Controls on the inline remote for volume, power, and track control follow industry standards, so there should be little confusion. There are several aspects that separate them as sport gear. 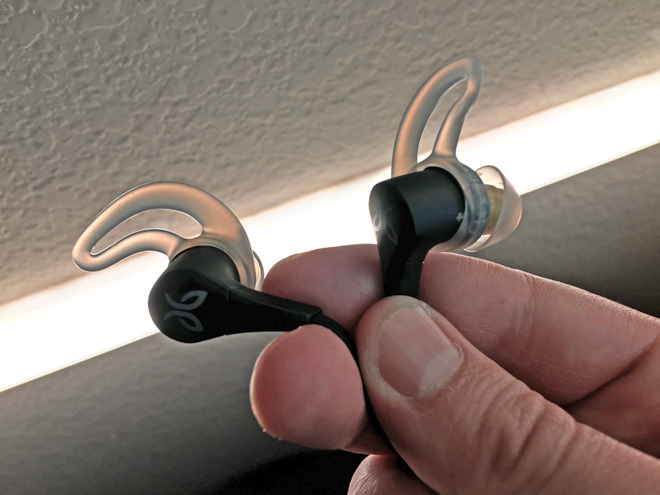 Above all, they're IPX7-rated against sweat and rain — something that's absolutely essential, since I've had conventional headphones short out and die at the gym, sometimes even delivering mild shocks. Included here are an updated version of Jaybird's signature "fins," which help anchor them in your ear while you're running or lifting. While I personally find the hooks on products like Apple's Powerbeats3 to be more secure, Jaybird does provide three different sizes in the box, and initially the biggest size seems to be good enough for me. The earbuds are connected by an adjustable strap, which can be worn loose, behind the head, or under the chin. You can further customize the X4 with several sizes of tips, among them some foam ones by Comply. I'll need to do some more testing before our full review, especially in the gym, but once you've picked out fins and tips the X4 seems comfortable to wear, moreso than the X3. The updated fin design seems to make a difference, perhaps because it's better rounded and feels less flimsy. One aspect that might sell people on the X4 over something like the Powerbeats3 is its custom EQ settings. 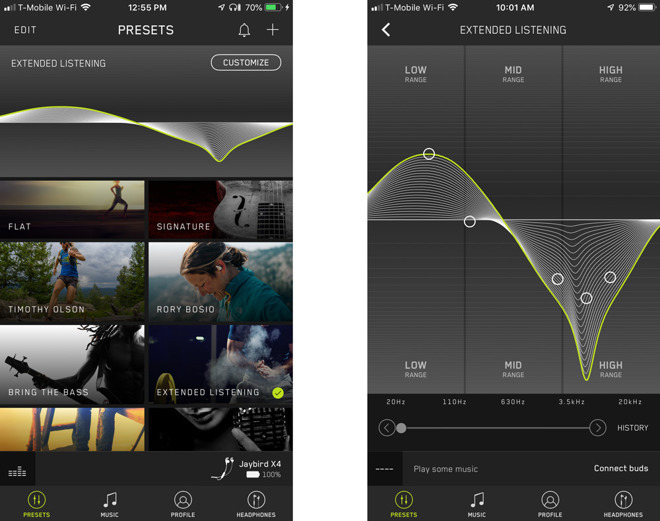 Through a companion iPhone app, you can manually adjust highs, lows, and mids, or turn to presets created by Jaybird as well as athletes, musicians, and regular users. In fact I would strongly recommend picking an EQ setting before hitting the road, since by default the X4 is tuned to be perfectly neutral. My early favorite was the "Extended Listening," which drops the highs and adds a mild bass boost. With or without a preset, though, I was generally pleased by the X4's sound — you won't get the heavy bass of something like Beats, but audio is generally crisp and excellent through any genre, even ambient electronic. Keep following AppleInsider for our complete review.